Star fruit, also known as carambola or star apple, originated in Southeast Asia and Malaysia, but can be found in tropical areas such as Florida and Hawaii. The peak season for star fruit is July through February. Star fruit is often used as a garnish or eaten raw. According to the Center for Disease Control and Prevention, star fruit is high in vitamin C and naturally low in fat with no sodium or cholesterol. Choose a star fruit that is ripe and ready to eat. It will be firm, possess a shiny yellow color and may have slightly brown edges. Rinse the star fruit under cool water to remove any dirt or debris. Dry the fruit with a paper towel. Place the star fruit on the cutting board horizontally. Use a sharp knife to cut off the ends of the star fruit; discard them. Slice the remaining star fruit across its width into your desired size pieces. The sliced fruit will be in the shape of a star. Remove any seeds from the star fruit, either with a knife or by pushing them out with your fingers. 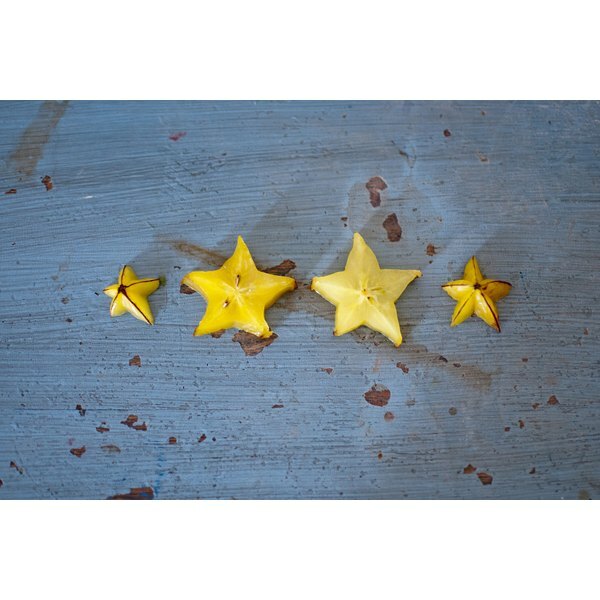 Cut away a small portion of each of the five tips or points of the star fruit. Remove the fruit's outer waxy skin by placing the tip of the knife between the peel and fruit. Trace the knife around the peel to slice off all of its edges. Eat the star fruit raw or add it as a garnish to drinks and recipes. The outer waxy skin of the star fruit is edible.